Some people in the marine industry are low profile, seldom seen outside of the boat show circuit. Yet some of them are key players in the growth and success of our lifestyle. Dan Streech is one of them. President of Pacific Asian Enterprises (P.A.E. ), he heads the company that creates the highly successful Nordhavn passagemakers. Anyone with an interest in our kind of boating has been aboard one of these rugged-looking vessels, which do much to fuel the voyaging lifestyle. Outside the circle of Nordhavn owners, Dan Streech isn&apos;t the name closely associated with Nordhavn. That would be Leishman, either Jim or Jeff, the brothers responsible for the design and conceptual development of those boats. But make no mistake about it, Dan Streech has an enormous impact on the Nordhavn evolution and production, and is, in fact, the man who pulls it all together. In our continuing effort to introduce you to men and women who make a difference, let me tell you about Dan Streech. Since 1974, P.A.E. has earned a reputation as a builder of competent sailboats and, more recently, of long-range ocean motorboats. The company today has 32 employees and balances production and commissioning of new boats with ongoing service to its many customers around the world. Without a traditional dealer network, this is quite a balancing act, requiring an organization with flexibility and depth that can quickly switch gears and priorities without losing the larger perspective. "There is constant chaos around here," Dan explains. "But by the end of the day, it all gets done. "At any given time, a person needs to know what everyone else is doing. We try to keep a collegiate atmosphere around here, and that team spirit is a big plus. Even the gossip helps keep it fun." Dan is P.A.E.&apos;s managing cheerleader, the guy who gets called when there&apos;s a problem. He is the glue that holds things together, the confidante of the people in Dana Point, California. It is no small task. "Buying a big boat is really tough for a customer, and tries even the most stable and rational person. The decisions that need to be made, the enormity of the project, the many options. It can be overwhelming. "Most people pay more for the boat than their house, and hopefully their spouse agrees. Much of the time the boat purchase also involves a change of lifestyle, a new beginning. "But it always takes longer than expected. During the commissioning, the fatigue factor is enormous. The need for a trip to the marine store for fuses must be balanced with dealing with aging parents, and returning the rental car. "Matching the dream to the reality runs quite a gauntlet." The modern big boat is a complex machine, and there is little aboard that is truly plug-andplay. Dan&apos;s particular strengths include his keen interest and expertise in systems engineering, exhaust systems, plumbing, electrical systems, drive train gear, and marine toilet systems. All of which is a good thing, as he gets hundreds of emails from boats out cruising. "Yacht building is unique in this world. Different industries have different approaches to customer satisfaction. If you don&apos;t pay your electric bill, for example, you lose service...whether you&apos;re happy or not. "In our business, a concern for customer satisfaction is paramount. Any disappointment whatsoever can lead to an unhappy customer. The "people" side of this is very important. "The risks are real; not spending enough time with each owner, having dinner together, even spending vacation time together. We want them to be happy. "In a way, we promise a lifestyle that will make people happy. So selling someone a boat, and going through the entire process to deliver the boat to their satisfaction, is very, very difficult." On that score, things today are more intense than ever. With so much demand for Nordhavns, there are always 10/15 boats active in the commissioning process. And it is Dan Streech who must keep everything on the straight and level. A few years ago, P.A.E. 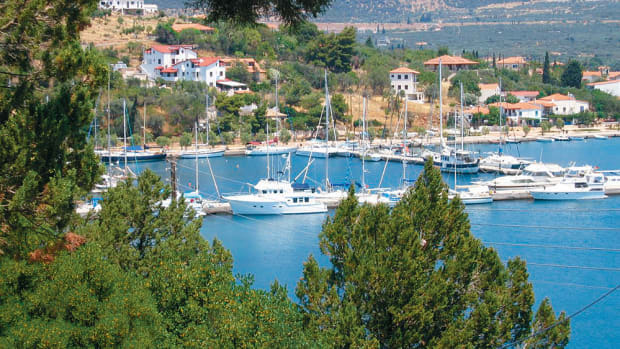 experienced a period where the explosion of boats and customers outstripped staff resources. It was solved by adding more middle managers to oversee the process. Despite the growing infrastructure, a need for continued management involvement remains today. "Taming the chaos of day-to-day is my most important focus," Dan reports. But it is not just about fixing problems. As P.A.E.&apos;s president, he also signs the checks and investigates invoice discrepancies. Cash flow is a headache he gets to worry about, as well as the hundreds of other responsibilities that make a business work. Growing up in Southern California, Dan was typical of the era, surfing and scuba diving as much as he could. He bought his first boat, an old 25-foot cabin cruiser, for $600. Once he fixed it up, it became his personal dive boat. Next came a 32-foot cruiser, on which he lived aboard while at college. It was here he fell under the spell of Eric Hiscock&apos;s tales of cruising the world aboard Wanderer IV. Somehow, Dan talked his teacher parents into selling their house, quitting their jobs, and taking Dan and his two sisters off into the sunset. The family bought a 1926 Alden sailboat, the 54-foot Malibar VII. Originally a gaff-rigged schooner, she was rerigged as a yawl, and her Chrysler Crown gas engine was replaced by a diesel engine built from two junked Mercedes 190D engines. Dan spread his hands as a yardstick as he talked of this time in his life. "Between Columbus and today, we were far closer to Columbus." The family hand-steered Malibar VII from Marina del Ray, California, to Fort Lauderdale, Florida, in eight months. The experience was life-changing for Dan. Returning to California, the family resumed their lives, but Dan followed a different drummer. He decided to become a boat broker and found his calling. In 1974, Dan opened Dan Streech Yacht Sales in Dana Point, California. In the coming years, Dan hired future partners Joe Meglan and Jim Leishman, and together they sold the CT line of sailboats, as well as the Transpac 49. \When they saw the first Baba 30 at a Long Beach boat show, they were amazed at the quality and construction of the boat and decided to follow the success of Seattle-based Bob Berg&apos;s Flying Dutchman and Baba sailboats. 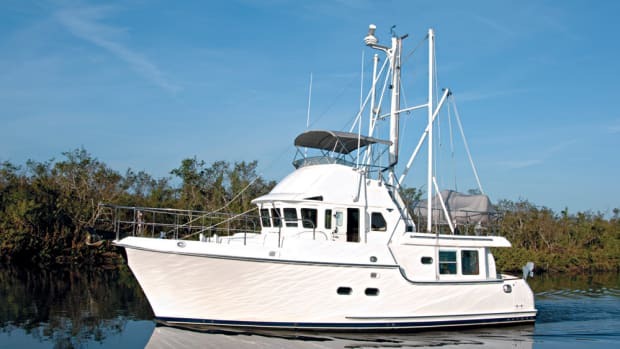 Streech and company hired Al Mason to design a fiberglass version of the Mason 38, which they went on to build in Taiwan. The Mason 38 gave way to the Mason 43 and 44, of which 150 were built, and other sailing models eventually joined the line. Times were good. When the Leishmans came up with the Nordhavn 46 concept, their Taiwan builder, Tashing, did not initially want the project, so the Nordhavn 46 was built by Sun Coast. The rest is history. When I asked Dan what he enjoys most these days, he just smiled. As the business grows, handson technical wrenching must give way to more meetings, more management, more financial analysis. But his core love is never far away. "Keeping the systems at their best, inventing systems, and tidying up existing systems are my true loves," Dan commented. "To battle inefficiencies with passive solutions that improve efficiency while actually reducing complexity really pleases me." For several years, Dan and I have kidded about a promise he made years ago while project manager of the Nordhavn 62. Seems he decided that Hull No. 25 was for him. As the years go by, the slot of that hull number gets closer and closer. Dan will soon have to either buy a big boat himself, or renege on his promise. Can he handle the stress? Today, Dan no longer manages the 62-foot model, as there are eight project managers who follow the cycle of building each boat. Dan focuses instead on standardizing the process. But the "people" side of things remains a critical issue for him, perhaps even more so than the boats. And that is impossible to standardize, although owner attitude helps. "A boat does not by itself make you happy. If you are a happy person, then certainly boat ownership can add to your happiness. But if you are not a happy person, don&apos;t expect a boat to do much to change that. "But the right person with a good boat will be one happy dude."